For many artists YouTube has become their main podium. I have seen many things on YouTube that I would never have seen otherwise. And I have heard a lot of obscure music too. Every few weeks I spend a night on YouTube watching and recording rockabilly songs. Last night I made the sixth compilation CD. There are a few live recordings on these CD’s of songs that I already have on LP or CD, but I especially search for video’s/songs of bands that have not released anything. And there is more than enough! I have no idea how much, because the YouTube search engine is a mystery to me. And since Reverend Horton Heat’s song Psychobilly Freakout is used in the interactive computer game Guitar hero it is no longer of any use to type in psychobilly as a search term, because all you get are videos of people playing that game. Dozens! I always like it when I end up on pages where are only videos of exotic countries. Psychoblilly is popular in Japan, Russia and many small East European countries. But if you don’t know the names of these bands, you cannot find them. I mean, you can only find them by accident. 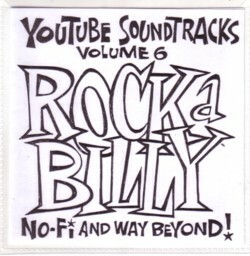 The new YouTube rockabilly compilation is now playing loud over the little speakers in my working place, and here are some of the songs that I like best. The Mad Heads is a band from the Ukraine and they have a whole of videos up on YouTube. Real good rockabilly, and nice videos too! Just when you think that this cover of this rather boring song is also rather boring, the band gets loose and displays all the magic that I love about music. I would love to see Little Neal & The Blue Flames live!